A UV Acrylic is a direct print on the reverse side of 1/8" TruLife Acrylic. UV refers to the instant ink curing provided under UV light. TruLife Acrylic giving your image a remarkable depth and brilliance that will make an impact on any audience. A protective backer is then applied followed by an inset 3/4” deep rear mounted frame. 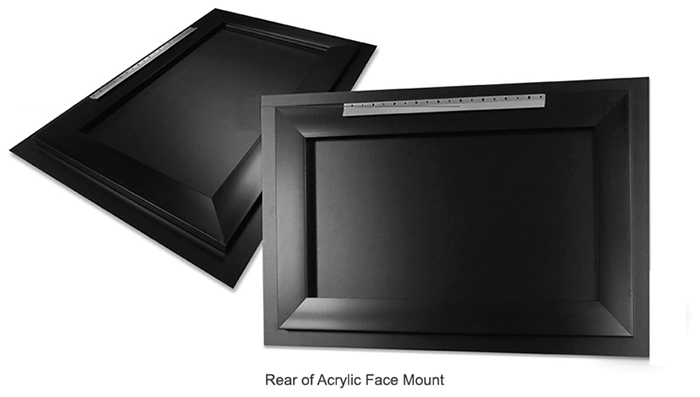 The sub frame allows the art to float off the wall. No frame required. Prints over 4 sq ft use a protective backer of 1/4" clear acrylic which results in a finished piece 3/8" thick. TruLife Acrylic is a single-sided, anti-reflective, abrasion resistant, anti-static, UV blocking acrylic developed specifically for printing and face/second surface mounting. Our production cost is higher than standard acrylic but absolutely worth it for the added quality. Think of it as an acrylic museum glass. Standard Sises. May vary depending on the images's aspect ratio. For example a 24 x 32 can be anywhere from 24 x 30 to 24 x 36. Larger sizes may be available depending on the image resolution. you can pay with any credit or debit card. Please allow up to 10 days before we ship your print.